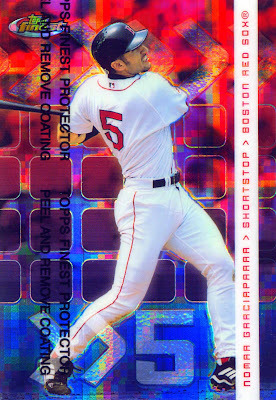 On July 23, 2002, Red Sox #5 Nomar Garciaparra celebrated his 29th birthday with three homers off Tampa Bay pitching, including a 4th inning grand slam that put Boston ahead 16-4. They went on score 22 runs on 19 hits, but the game still took under 3 hours to finish (box score). Nomar's 3HR, 8 RBI, and 12 total bases remain single-game records for a player on his birthday. I was at this game. I still have the ticket stub buried somewhere. Wow, cool. It must've been like a river of runs in those first few innings.